With OS X Yosemite, Apple has included a number of Continuity features that improve the integration between iOS and Mac devices. OS X Yosemite includes a feature called Instant Hotspot which allows users to more easily use their iPhone's wireless cellular data connection from their Mac or iPad. You need iOS 8.1 and OS X Yosemite in order to use Instant Hotspot. You also need to ensure that your data plan with your wireless carrier allows for internet hotspot capabilities. In the United States, AT&T, Verizon, and T-Mobile, allow phones to be used as hotspots with select data plans. Sprint offers mobile hotspot capabilities with a monthly add-on plan. Also, make sure both your Mac and iPhone are logged into the same iCloud account, and check that your Mac supports Instant Hotspot. This can be done by clicking the  symbol in the top left-hand side of the Menu bar, navigating to About This Mac, clicking on System Report and clicking on the Bluetooth listing. You should see information about whether your system is compatible with Instant Hotspot and Handoff. 1. 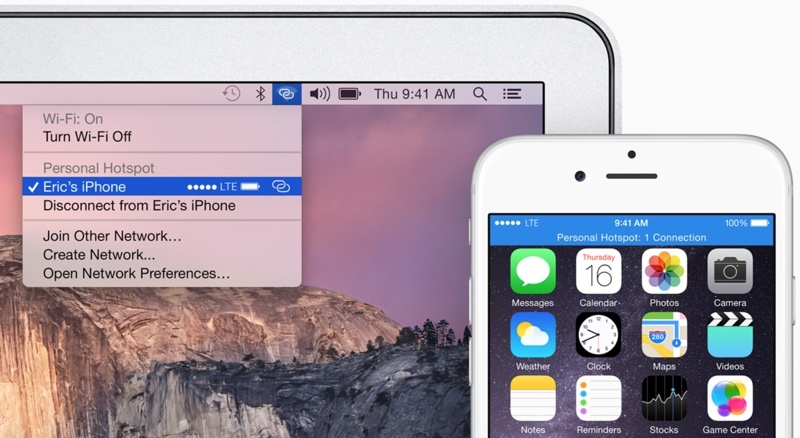 Turn on Wi-Fi on your iPhone (Settings -> Wi-Fi) and Mac (Menu Bar -> -> Turn Wi-Fi On. 3. On your Mac, click the Wi-Fi symbol in the menu bar. A new "Personal Hotspot" heading now appears near the top, and will be followed by the name of your iPhone. On the right side of your iPhone's name, signal strength, network type, and available battery life are displayed. Click on your device's name to begin using it as an Instant Hotspot for your Mac. 4. You may now begin using the Internet on your Mac with your iPhone acting as an Instant Hotspot. On the Mac, the Instant Hotspot connection between both devices is represented by a special icon that shows a link over the traditional Wi-Fi symbol. On the iPhone, the connection is represented by a blinking blue bar that shows that a Personal Hotspot is active. When a tethered Mac or iPad switches to a Wi-Fi connection or is no longer connected to an iPhone, Instant Hotspot automatically turns off. This feature is designed to save battery on the iPhone, because tethering can use a significant amount of battery life. While we had few issues with Instant Hotspot, several members of our forum have had more inconsistent results. Several people have had to try logging out and back into iCloud on their devices, turning Wi-Fi off and then back on, or even rebooting their devices. These steps may help if you are having trouble turning using Instant Hotspot. I think a necessary step is missing from this guide. Well this is just stupid and pointless if I have to pay extra just to use this feature with my carrier. If it eats up my bandwidth, so be it because that is my decision, but it should not cost extra to use it. I dont understand why cover the name of the phone and network? Because it's my real name (ok part of) and my real nickname. :o Kind of personal. Hahahaha, for 15.99€ a month I have everything unlimited here in France. The US prices are ridiculous. It works as reliably as al the Handoff features, which is, not at all - probably 30% of the time. I've seen it appear. It doesn't appear right now though. I'll usually get Handoff working between iPhone and Macbook and not the other way around. Then i'll reboot the Macbook and it'll work from Macbook to iPhone and not the other round. It's one of the buggiest features Apple has have made...a theme of the times lately unfortunately. When's the Yosemite update coming? I agree, I was pulling my hair out trying to get this to work consistently last night. At first my mac found the iPhone hotspot and tethered with no problems. Then I tried with my iPad and it would find the hotspot but not connect. Then it wouldn't find it at all. Then the mac couldn't connect to it anymore either, but still find it. Then the iPad could connect but the mac still couldn't. Tried resetting all 3 devices and resetting network settings. It just doesn't work consistently. The big irony is of course that it was supposed to replace the old hotspot method and make it less clunckly and more streamlined, yet it's done the exact opposite, for me anyway. Welcome to 'Merica, the land of liberals, infinite taxes, and idiocracy. If I have a 4GB data plan, then I should not have to pay extra to use it for a hotspot. EDIT: After trying what was stated in the above article, I got it to work when trying the "Troubleshooting" tips. I first connected to the same WiFi network, turned on Bluetooth, then I signed out of iCloud on both my iPhone and my MBP. Then I restarted each device, and then signed back into iCloud and it "just work[ed]." If you click on the WiFi icon in the menu bar and don't see it at first, wait a few seconds and it will appear (If everything else is done correctly).